How viable are “Mono” type characters going to be in the 25 level span? “Mono” referring to a given character taking only powers originally associated with his class (Warrior taking only [Cronks], Rogues [Stunts], and Spellcasters [Spells]). Would a Warrior taking only cronks be basically just a boring sack of numbers, with no real abilities to complete challenges beyond combat? Would a Rogue’s Skills scale to be competitive with higher level challenges, capable of performing in an environment beyond simply skill checks? Would A Wizard/spellcaster’s spells take little hit, especially at higher levels where more and more PC’s likely obligated to take Spells? Or perhaps they’d mostly lack the numbers to do the other challenges all that well, kinda coasting on a middle-road of sorts? Otherwise, what issues would crop up for these “Mono” type characters? (I’m mostly interested for Warrior, Rogue, and spellcasters the least, but am curious what may have in mind). A Thought had occurred to me the other day. I know you busy at work on Five Moons finishing up the Magic Items, and Armor. Pending if its simply getting higher level Items (20th+ or like), could release the playtest “Unfinished” in some parts. So we’re giving you valuable data as you’re finishing up those bits, as if its at high levels, it’ll least be a bit before we get to that point. Secondly, separate from the above, and I mean no disrespect of course. 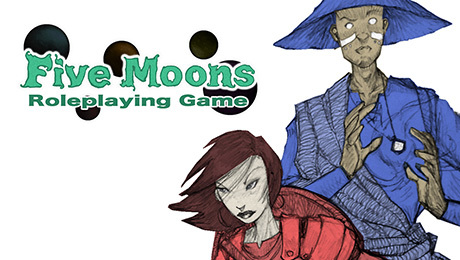 I was wanting to make the request if we could get Bi-weekly Updates on the progress for the Five Moons Document? Whether its finishing up the Playtest, and/or refurbishing of the final product post-playtest release. I heard he got a job back at Wizards of the Coast…and admit I’m wondering how that will be affecting his updates and work on Five Moons myself. He’s said its a non-Design job somewhere, about how its to help organize D&D properties like Forgotten Realms for people interested in using the license (so like the Neverwinter MMO, Swordcoast?, and other potential video games I guess). It is looking good. I think he is on the right path to avoiding ability/feat bloat as well.